The book of Philippians is one of the 4 prison letters written by Paul, written to the Church of Philippi to comfort them at a time when he was imprisoned and many Christians were in anxiety over his plight. The theme of the book is joy, and the gist of the book is really summed up by Philippians 4:4 – Rejoice in the Lord always. I will say it again: Rejoice! In todays’ verse we’re going to talk about peace, which is not unrelated to joy. What is this peace that comes from God, that it is able to grant us joy even in tough times? The peace that comes from the Lord must be differentiated from the peace of the world, which is generally a peace that revels in good circumstances. The term ‘world peace’ always means no war, no strife, no conflict, free-trade zones etc. When a man is at peace, he is satisfied with various aspects of life. To give people a peace of mind, the world offers insurance, contracts, policemen, helmets and so on. Many circumstances and things can rob the world of its peace. But Jesus says, peace I leave with you; my peace I give you. I do not give to you as the world gives [John 14:27]. The peace of God is not that worldly peace. The peace of God grants us joy even in difficult times and depends not on our circumstances, but on our relationship with God. We are limited because there are many things that we do not understand. God‘s psyche is vastly superior to ours. He isn’t limited like we are. In transcending all understanding, God has surpassed and gone beyond the limits of all understanding – be it our modern understanding or the ancient understanding or an understanding that has yet to come. It’s a peace that is so great that we’ll never understand it. Indeed, the world doesn’t understand God‘s peace. How are we able to stay peaceful in times of danger or affliction? How are we able to still rejoice and praise God even in disaster and in times of great loss? The world doesn’t understand; and perhaps, we don’t too. How do we explain that peace? Don’t expect me to dissect it; but I do have an answer – God. I really can’t explain it better than that. Because of God, who is able to transcend all understanding, we can have peace in good time and bad times. We can rejoice in the Lord and rejoice again [Phil 4:4]. What threatens the worldly peace? Betrayals. Disappointments. Failures. Pride. Sickness. Death. Fear. Anxiety. Anger. Grief. The list goes on. These that threaten the peace of the world are the very things that the peace of God will guard us from. The peace of God will remove the anxiety from our hearts – the anxiety about life, about death, about everything. But we have to first turn to God in our trials and needs [Phil 4:6]. When we turn to God in everything, by prayer and petition, with thanksgiving, it is our act of faith. Romans 5:1 tells us that since we have been justified through faith, we have peace with God through our Lord Jesus Christ who he himself is our peace who has made the two one and has destroyed the barrier, the dividing wall of hostility [Eph 2:14]. When we turn to God in times of trials; our minds will be freed from our anxiety, and we will be at peace, which in turn, keeps us from further anxiety. 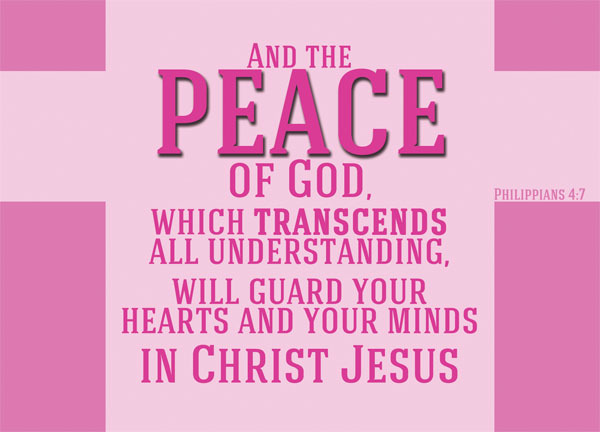 Jesus is the Prince of peace [Isaiah 9:6], and through our faith in Christ, we gain the peace of God that transcends all understanding, a peace that surpasses our expectations or imaginations, in a manner that we cannot measure. This gal does great stuff! Dear heart you are a precious, precious jewel. My daughter told me about you and what a wonderful site you have. You recently liked my post, “The Suffering Saint” and so I wanted to take the opportunity to say thank you and to read something by you! What a treat, what a joy to find someone so young who has not only the desire to read the Word of God but has done so faithfully and is sharing what she’s learned with others. I pray for your continued growth in the Lord, never stop seeking Him precious heart; from this older woman to you, it just gets sweeter as the days go by. I feel every bit as honoured as I am underserving of your compliments, but thank you very much, really. I appreciate your prayer; I value the blessings from my elders greatly! Once again, thank you, but above all, thank God for you.